Talking about Fuji icons in Nigeria, General Kollington Ayinla will definitely be counted among the first to be mentioned in the Fuji genre. 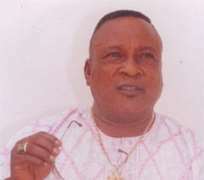 For more than 50 years, he has been doing what he knows how to do best, and he is still waxing stronger in the Fuji music business. According to him, he is coming up with an album soon, and to his fans he says they should expect Kollington unusual. In this interview with Aramide Pius, the self-styled music General speaks about his career, his emergence in the Fuji music scene as well as the idea behind his contracting Highkay Damcent alongside his Manager, Adelana Olabanji to market his oldies and soon to be released album. Life is well with me. I have not been quiet. Rather, things are going on under ground, I have been working and something tangible will soon be out. What are we expecting from you in this season? What prompted your decision to hand over the marketing of your old works to High Kay Damcent? I know that the man is a very straight forward person. Notwithstanding where he comes from(Ibo), he is a very honest man. And that was the more reason I handed over the job of marketing my oldies to him. As a veteran in the Fuji music genre, do you foresee any future in this brand of music in Nigeria? The upcoming artists are doing fine, and I can see the Fuji music doing better in the nearer future. Do you think, it's a welcome approach to playing fuji music, especially when it is blended with hip-hop as experimented by the upcoming artistes? For the purpose of uplifting the fuji music genre, it is a good development. I support the new trend, and that was the reason I said that they are keeping the Fuji flag flying by taking it to another level altogether. How would you describe the Nigerian music industry? We are not there yet ,except God would help us to surmount the varied problems the music industry is facing in Nigeria. Our government is not doing enough for the industry, especially as it concerns the issue of piracy. Because that is the only way we can enjoy the fruit of our labour and earn our livelihood from what we have worked for. Piracy! what can be done to curb the menace of piracy in our society? For us musicians, we have been trying to combat piracy. But our effort will be made more meaningful if the government decide to support our noble cause. Also, there is need for the various corporate organizations to begin to appreciate the works of our local artistes. Oftentimes, they engage the services of the foreign artistes in terms of their commercials in place our local ones. Within and outside Nigeria, I have never seen Fuji music being used for any commercial purpose. We ought to be helping ourselves but we are not. So government should be able to do something in this regard. As a talented Fuji maestro, do you have any memorable experience ? One of such moments was when my house got burnt; it was a terrible experience. A very sad one. I want to thank the Federal Government for the support they gave to me at that time. The person of General Ibrahim Babangida who sent the then, Minster for information, Chief Alex Akinyele to come and console me. He later handed over a cheque to me. Also the governors including, the late General Sanni Abacha rallied around me. General Sanni Abacha also gave me a cheque. How old were you when started your musical career? I was ten years old when I started my musical career. I started 50 years ago. Back then, the Morning Post newspapers used to write about me, they would say 'Ten years old Kollington Ayinla won Nnamdi Azikiwe cup. What was the reaction of your parents when you started out? Initially, they did not support me, but they later gave their support when they realized that I was serious with it and that I have a passion for music. How did you convinced them to support your career in music? I used to run away form my house to go to where I was learning how to play music. And when I returned, I'd end up being beaten. But when I started becoming popular in my area everything changed for good. At that time, my very bosom friend, Sikiru Ayinde Barrister was at Mushin, doing his thing. At the end of the Ramadan festival , they would arrange for a competition, where they would bring out a trophy for us to compete. I happened to have won the Nnamdi Azikiwe cup in 1965 and Sikiru Ayinde Barrister won the Coca cola Cup the same year. It was a very long time, I can not remember that now. Would you mind reconciling with her? What advice do you have for upcoming artistes? I don't smoke, I don't drink and I don't go out anywhere. I only go out when I have shows. I am usually at home. My friends come in to visit me. What do you in the offing? I am cooking something fine but I don't want to disclose the title yet until it is out. But it is definitely something good. What you have never seen or heard before from Kollington Ayinla are all in the album. You just wait for it to be out. It is not Kollington as usual but a brand new Kollington is what is coming out soon. What is your relationship with your contemporaries in the Fuji circle? My relationship with my contemporaries is very cordial. My cordial relationship goes beyond the Fuji circle; it extends to other musical circle as well because King Sunny Ade is a very close one to me. My greatest wish is long life, sound health, prosperity and more blessings. Yes, I am very fulfilled.